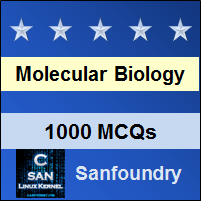 This set of Molecular Biology Multiple Choice Questions & Answers (MCQs) focuses on “Transcriptional Regulation in Eukaryotes is More Complex than in Prokaryotes – 1”. Explanation: Enhancers can function over very long distances, sometimes even from different chromosomes. This process, termed Transvection, has been best studied in Drosophila and involves trans-acting enhancers from one gene regulating the expression of its homolog on a separate chromosome. Explanation: Enhancers were first identified in SV40 virus. In addition to a TATA box another two 72-base pair repeats located farther upstream are required for efficient transcription from this promoter known as the enhancer sequence. 3. Enhancers in which of the following positions is unable to enhance the process of transcription? Explanation: Without an enhancer, the gene is transcribed at a low basal level. The enhancer is active not only when placed just upstream but also when inserted upto several kilobases upstream or downstream from the transcription start site. 4. Immunoglobulin enhancers are active in which of the following cell types? Explanation: A well studied example is the enhancer that controls the transcription of immunoglobulin genes in B lymphocytes. Gene transfer experiments have established that the immunoglobulin enhancer is active in lymphocytes, but not in other types cells. Thus, this regulatory sequence is at least partly responsible dor tissue-specific expression of the immunoglobulin genes in the appropriate differentiated cell type. 5. Enhancers are a unit of multiple functional sequence elements that together regulates the expression of a gene. Explanation: An important aspect of enhancers is that they usually contain multiple functional sequence elements that bind different transcriptional regulatory proteins. These proteins work together to regulate gene expression. The immunoglobulin heavy-chain enhancer, for example, spans approximately 200 base pairs and contains at least nine distinct sequence elements that serve as protein-binding sites. 6. The enhancers are gene specific regardless of the presence of insulators. Explanation: Although DNA looping allows enhancers to act a considerable distance from promoters, the activity of any given enhancer is specific for the promoter of its appropriate target gene. This specificity is maintained by insulators, which divide chromosomes into independent domains and prevent enhancers from acting on promoters located in an adjacent domain. 7. Transcriptional activators consist of __________ domains. Explanation: Transcriptional activators consist of two independent domains. One region of the protein specifically binds DNA; the region stimulates transcription by interacting with other proteins, including mediator or other components of the transcriptional machinery. 8. The activation domain of activators recruits transcriptional factors to proper sites on the DNA. Explanation: The basic function of the DNA-binding domain is to anchor the transcription factor to the proper site on DNA. the activation domain then independently stimulates transcription through protein-protein interaction. 9. How many mechanisms are present to enhance transcription by the enhancer molecules? Explanation: The activation domains of eukaryotic transcription factors stimulate transcription by two distinct mechanisms. First, they interact with mediator proteins and general transcription factor to recruit RNA polymerase and facilitate the assembly of a transcription complex on the promoter. Eukaryotic transcription factors interact with a variety of co-activators that stimulate transcription by modifying chromatin structure. 10. Which of the following steps for the production of RNA is not regulated by enhancers? Explanation: It is also important to note that activators not only regulate the initiation of transcription. Elongation and RNA processing can also be regulated, both by direct modulation of the activity of RNA polymerase and by the effects on chromatin structure.